Never mind that an electric kettle is not a kitchen necessity per se, but with one, you can save time when preparing your morning French press. When scouting for the best electric kettles, be sure to go beyond the physical appeal. Yes, you’d love to place a chic appliance on your kitchen’s countertop, but that’s not all there is to consider. If you can’t stay without a cuppa coffee, this kettle is for you. 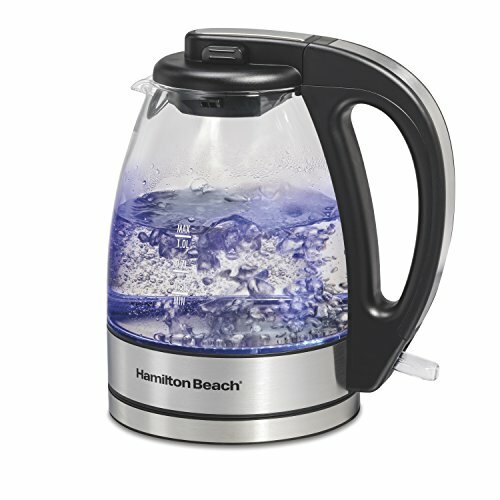 It may not be one of the fanciest electric kettles on the market, but it works way better than a microwave and will get your water boiling fast. Available in silver and red, it has a 1.7-liter capacity and an auto shut off feature to provide protection in case the carafe runs out of water. 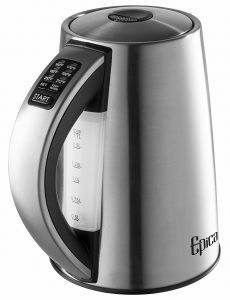 This stainless steel electric kettle has an easy-to-pour spout so that you can fill and serve with ease. You can lift it off the 360-degree rotating base, enabling you to bring at the table when you have guests. 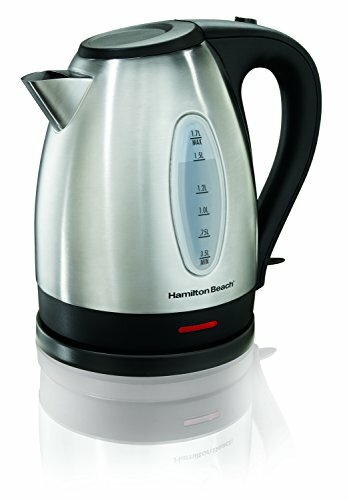 The Hamilton Beach 40880 Electric Kettle is compact to save space on your kitchen’s countertop or table. It even has a power indicator to notify you when it’s on/off and a push button lid for quick access to the jar when you need to clean it. Forget the basic design; this electric kettle boasts a host of nifty features to make it a handsome addition to your kitchen. It is cheap, fast and lightweight. Weighing a mere 2.1 pounds, it could very well be the best electric kettle if you have weak wrists. Users hail this unit’s quiet operation as well as the comfortable stay-cool handle. The 30-inch cord offers flexibility while the washable spout guarantees the purest results. Note – the cord wraps conveniently under the base for easy storage. 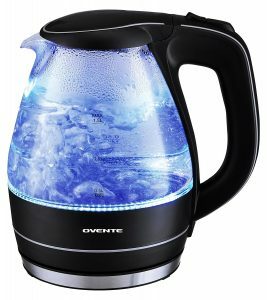 If you don’t have a lot of boiling to do, the Ovente Cordless Electric Kettle will serve you well. It has a 1.7 liter capacity with 1,100 watts of power that enables it to boil water in 5 to 6 minutes. Plus, you can measure the precise amount of water thanks to the clear gauge on the side. With an incredible six temperature setting, this kettle makes an excellent choice if you love to sip green and white teas. 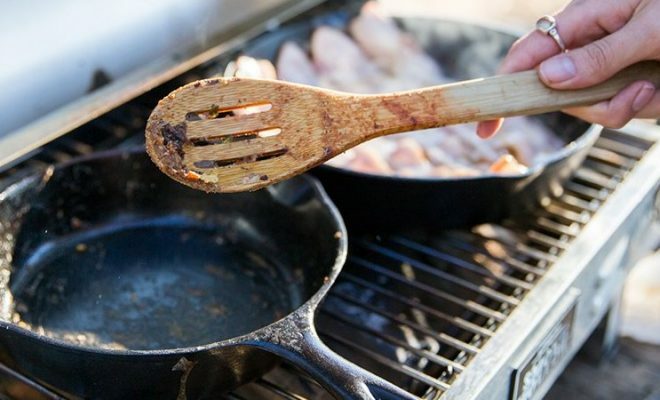 It allows you to set the correct heat levels to bring out the best flavor from your beverage. 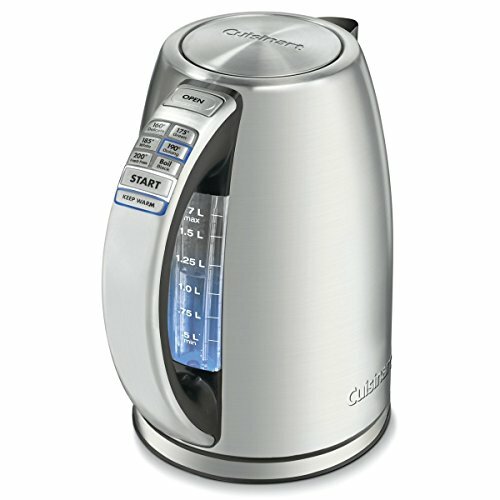 Simply put, this unit is the closest you can get to brew your drink to perfection. 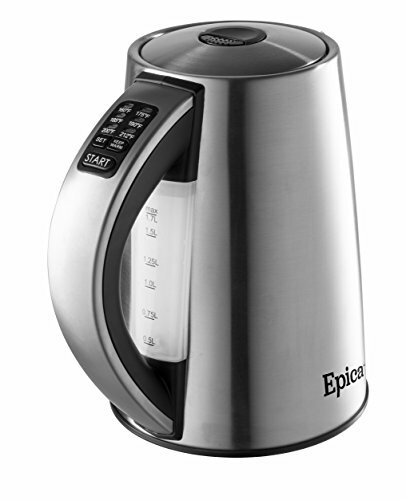 The Epica electric kettle also comes with a thirty-minute “warm” button to ensure that your tea or coffee stays hot until you’re ready to serve. Meanwhile, the highly responsive two-minute setting lets you have hot water at a lighting fast speed. 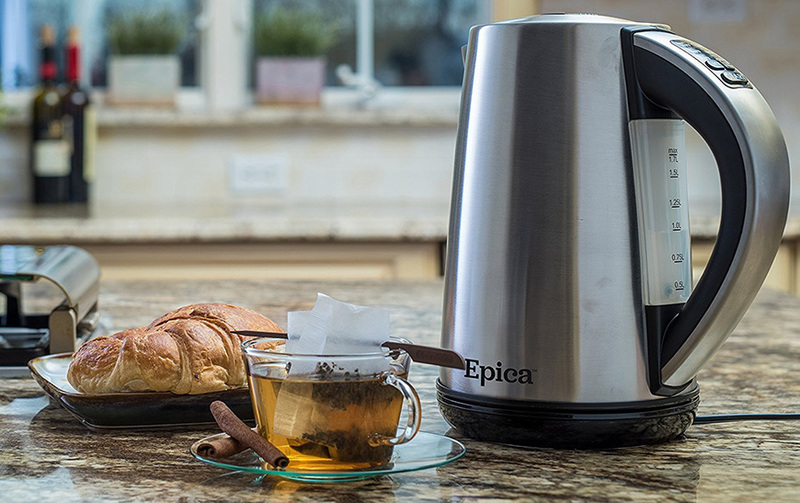 The Epica 6-Temperature Electric Kettle is for the individual who’s shifting from green tea to herbal infusions, oolong tea, and black coffee. It is robust, using 1500 watts of power to heat water. With such a performance, it undertakes to boil up to seven cups of water at once. 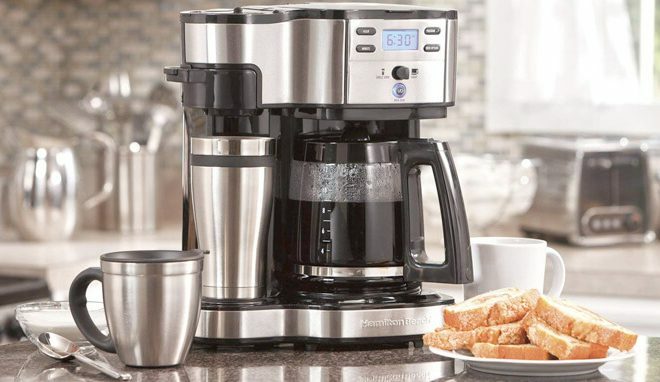 The Hamilton Beach 40930 can do it all whether you’re talking about hot chocolate or instant tea. 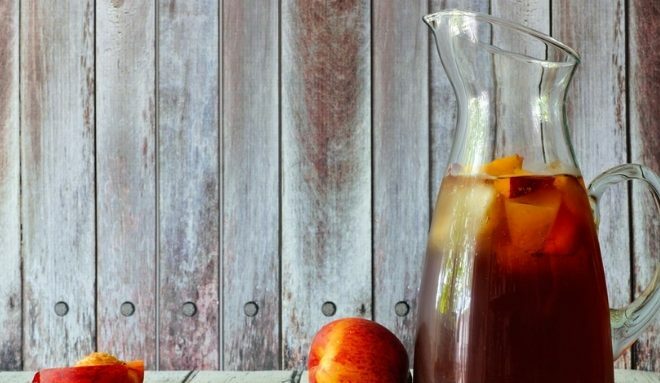 It has a lovely pouring action and an easy to lift jar for cord-free serving. 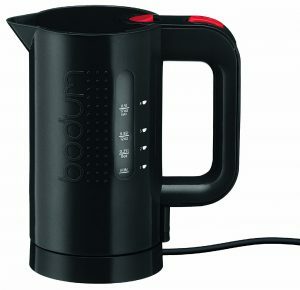 And, with its extra-large capacity, this electric kettle makes a solid choice for a medium-sized family or busy office. The 40930 also features an automatic safety element to prevent it from discoloring or boiling dry. 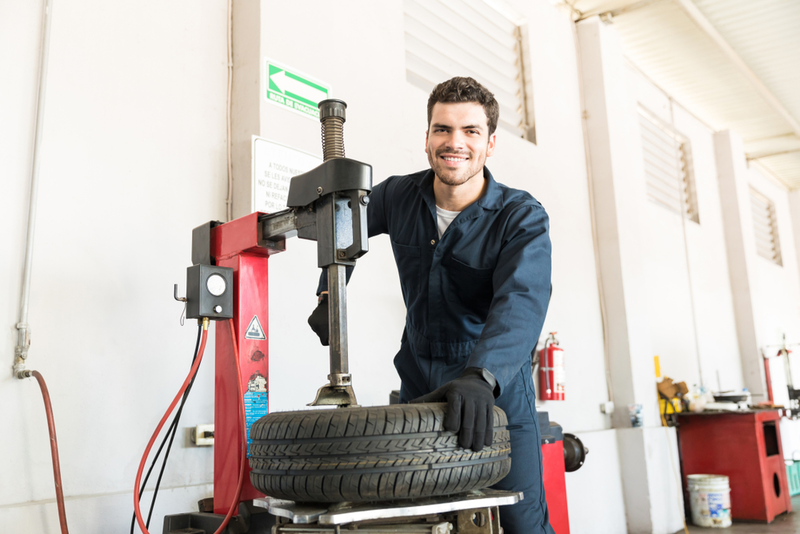 In essence, that gives you peace of mind regarding your safety during and after use. 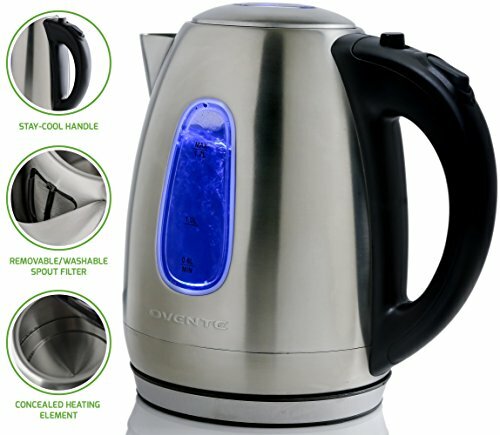 Evidently, the contemporary soft cobalt light accentuates this kettle’s stylishness. 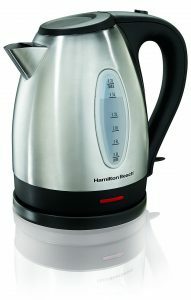 Choose the Hamilton Beach 40930 glass electric kettle if you’re in need of a proper cup of coffee or tea every day. It is ready to use right out of the box and has a space saving design. Those who’ve used it say it’s fast and doesn’t make a lot of noise either. 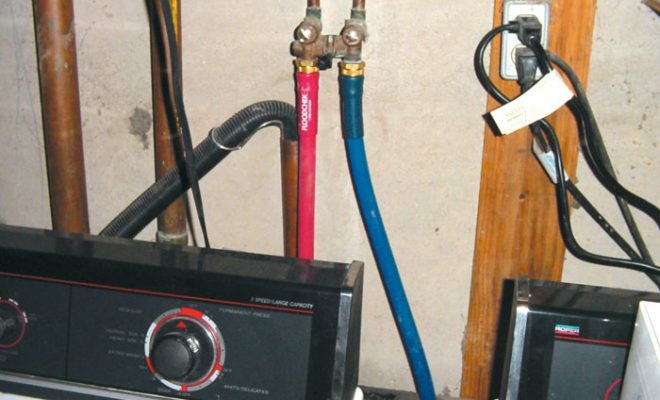 One of the most common gripes about electric kettles is a rusting interior or the breaking of plastic parts. Well, that should be the least of your concerns with this model. It has a stainless body from the pot to the interior, lid, spout, and rim. In other words, the water doesn’t come into contact with plastic, thus keeping it safe. This kettle’s innovative construction makes it extremely durable. Plus, the double wall design ensures that the water stays warmer for longer while the BPA-free cool touch exterior reduces the scalding hazard. 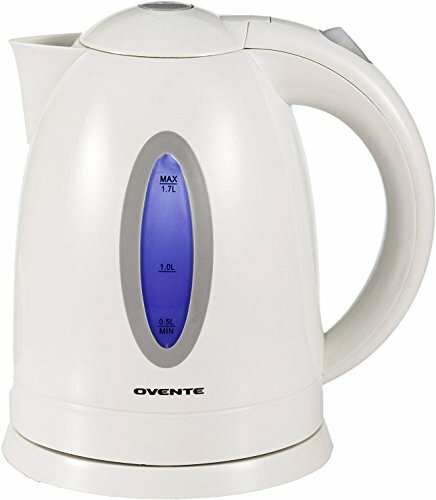 With the ability to outlast most models in its class, this is one of the best electric kettles if you want a unit that will serve you for months upon months. It has a large opening allowing you to access the carafe to clean away any deposits left at the base after boiling the water. 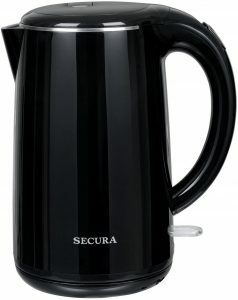 The Secura electric kettle has a 1.8-quart capacity. This retro-looking electric kettle by Ovente comes in an assortment of colors from white to baby pink and green. 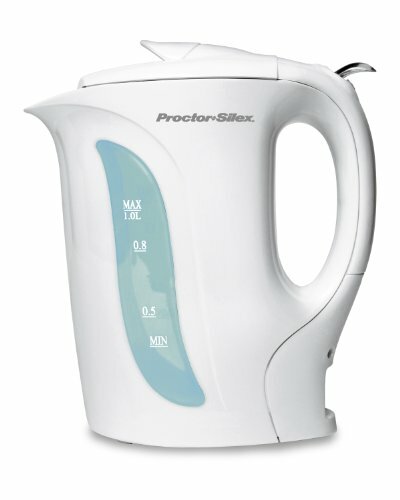 While it doesn’t have the bell and whistles of most models, this kettle is practical and speedy. The one thing that makes it an attractive option is the inexpensive price tag for low-budget shoppers. Never used an electric kettle before? Not a problem! This model comes with a LED indicator that lights up when the water starts to boils and shut off after boiling. The built-in filter eliminates limescale deposits, a function that comes in handy if you haven’t installed a faucet water filter on your kitchen tap. 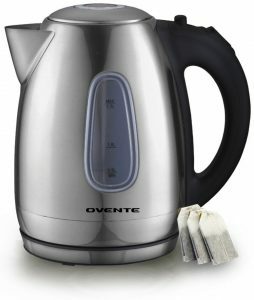 The Ovente BPA Free cordless electric kettle is not only cheap but also economical to use. With 1100 watts of power, it uses less energy and can boil water in five minutes. 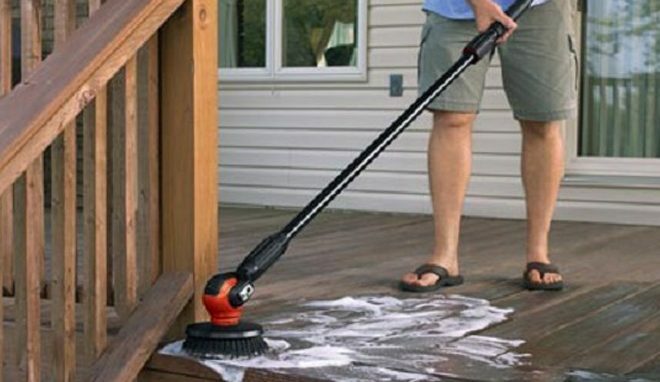 You won’t have a problem handling it too, thanks to the ergonomic, firm-grip handle. 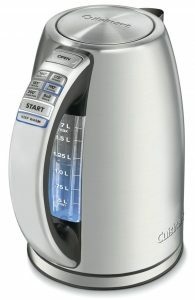 Boasting 1500 watts of power, the Cuisinart CPK-17 can take up to 3 liters of water to a rolling boil in minutes. Even better, it sports six preset heating, for seeping tea at the right temperature while preserving the flavors. Just press the simple one-touch buttons on the handle, and you’re good to go. And, those aren’t the only reasons this model deserves mention among the top 10 best electric kettles. It also has a memory function that lets you lift the carafe for up to two minutes without shutting off or interfering with the brewing process. Trust Cuisinart to come up with well-thought-out kitchen appliances. The CPK-17 will take your water boiling experience to the next level with its five-star performance. It has a lid release button for quick opening, 360 degrees swivel cordless connector and splash guard to keep your serving table dry. Check it out! If you have cravings for a morning cup of coffee, you’ll love this fast-boiling electric kettle. 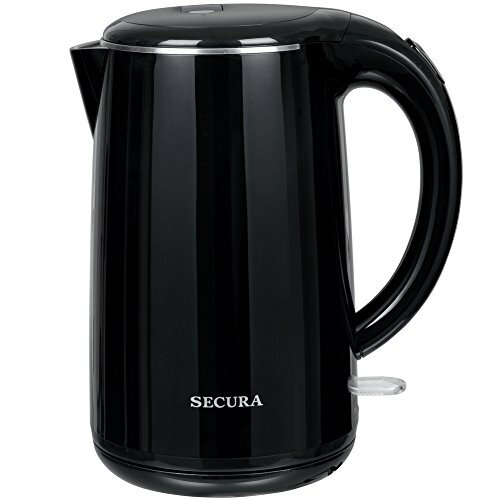 It is one of the quietest models on the market, permitting you to make your cup without waking the rest of the family. And with the unit’s dual water windows, you’ll always boil the correct amount of water as per your needs. Perfect for dorm and office use, the K2070YA has a detachable cord for effortless pouring. It has a 1000 watt heating element so that you can savor oatmeal and soup mixes right away. 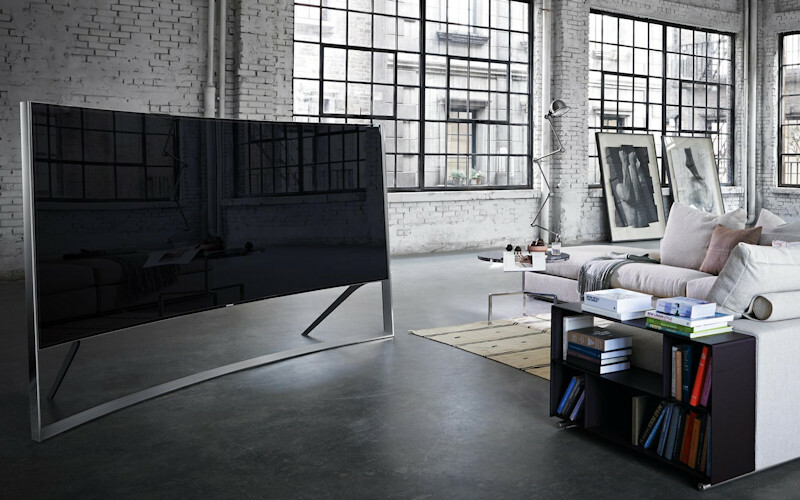 Fans say it scores considerably well when it comes to durability. 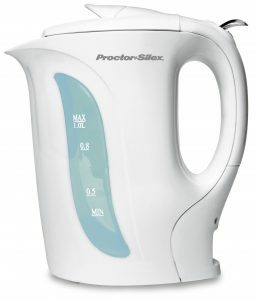 The Proctor Silex K2070YA is one of the most reliable electric kettles that promises to prove its value over and again. Judging the customer feedback, there’s every reason to believe it works as advertised. The manufacturer says it undergoes 10,000 cycles during the production phase to test the performance. 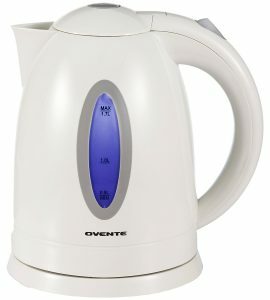 If you care so much about your appliance’s aesthetics, this Ovente electric kettle will tickle your fancy. It comes with eye-catching borosilicate glass, complete with a blue LED lighting. 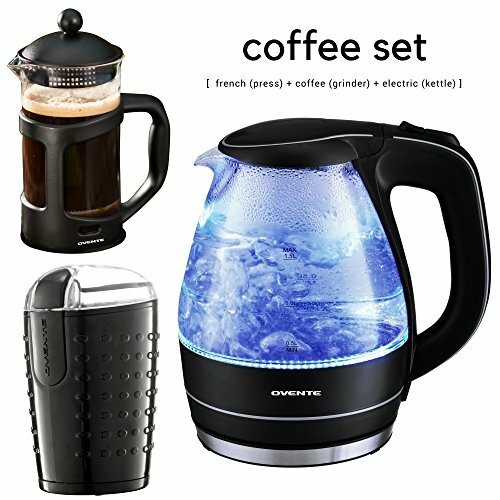 It could also be a good choice if you live alone and only want a model that can boil one cup of water at a time. The glass exterior will keep you in the loop as to how much water is left while the removable spout allows you to fill the carafe from the tap. This electric kettle is a dazzler and has a performance to match. The limescale filter does an excellent job at reducing the accumulation of minerals inside the carafe, making this kettle ideal for everyday use. What’s more? The variable temperature settings ensure that you get the optimal results out of your hot water. It doesn’t get better than this model by Bodum BISTRO. We reckon that it’s the best electric kettle whether you’re talking about affordability or the ability to heat water fast. It has enough capacity to hold up to four cups of water and responsive controls for painless functionality. You’ll love the contemporary design with a retro twist not to mention that you have a choice of four colors. This electric kettle also comes with a meshed screen spout to capture chalk and other sediments as you pour. 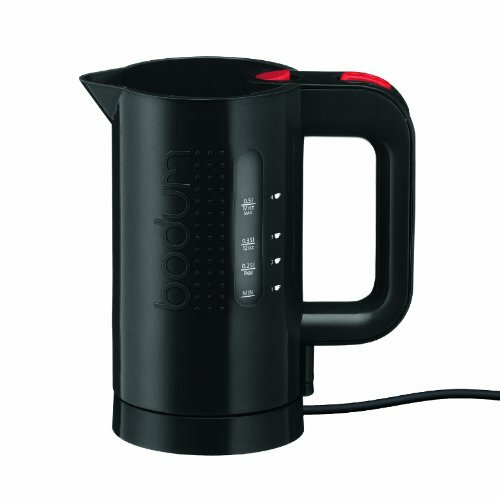 The Bodum BISTRO electric water kettle is for a coffee aficionado or a tea lover who just can’t stay without sipping his favorite drink. 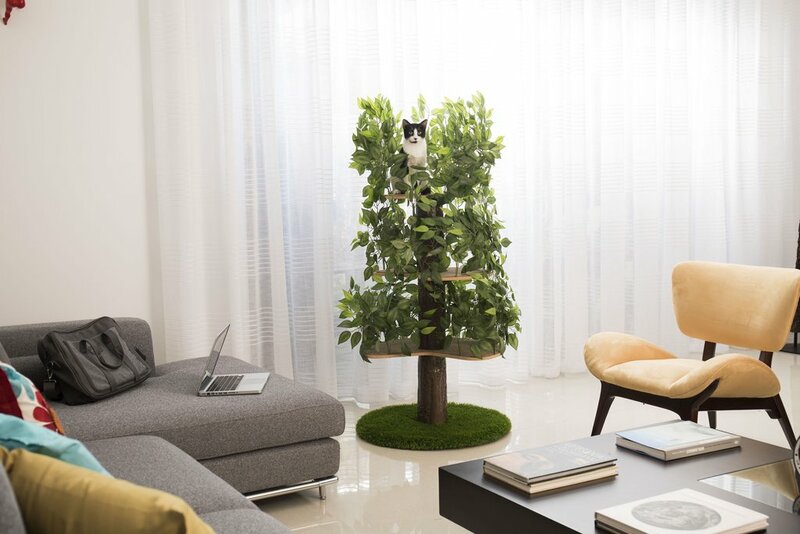 Indeed, there’s more to this model that won the if product design award. The best way to experience what it can offer is to have one in your kitchen!